Thank you for your purchase of this dekatron spinner kit. Available on eBay, as either a bare printed circuit board (PCB), or with all requisite parts, less the dekatron, along with the PCB. 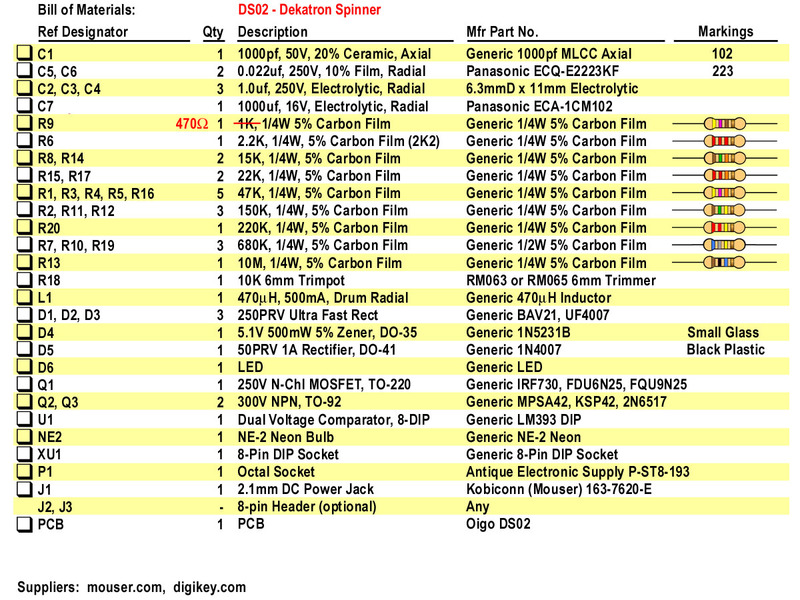 As opposed to most dekatron spinner circuits, on-line, this unit is powered from a low voltage source. 12V nominally, and draws ~120mA of current. The circuit, itself, “pumps up” the voltage to the required 450V, that these tubes need. Update August 2017: Kits sold after August 7, will be the model DS02 Version. The board layout has been re-arranged, and some circuit changes made. The 12V power jack (P1) has been moved. The speed adjustment for the neon relax oscillator has also been changed. Several other value changes have also been made. The upper portion of this page will cover the newer DS02 kit, followed with the old version lower on this page. Update June 2015: Revision B, but using Revision A Board. A few value changes. The prior values still work. Newer values increase voltage, and put less stress on the components. Update September 2012: Jumpering info added to support OG-8 & OG-9 dekatrons. OG-9 jumpering corrected Oct 15, 2012. Note: Dekatron is not sold with kit. You need to acquire that separately. The circuit works the same as the prior version, with some value changes. See prior version (later on this page) for the details. The main electrical difference, is the speed adjustment for the neon relax oscillator. On the old version a simple trimpot presented the varying voltage to R13, altering the current flow thru it, and therefore the charge rate of C5, and pulse speed. On this new version, an intermediate transistor stage (Q3) is inserted, so the trimpot now is only exposed to voltages ~5V. Trimpots capable of handling high voltages, as in the old circuit, are becoming more difficult to get. This new change also lets the end user swap in a digital pot, which has been requested on occassion. The variety of parts have been reduced, but 2 additional resistors, and a transistor have been added. Note: that the power jack (J1) has been centered on one edge of the board. Also allowing for package variation for the power FET (Q1) and voltage reference (D4), has been removed, so as not to cause confusion. To modify the jumpering on J2 & J3, to accommodate dekatron types other than the OG-4, see the older instructions below. J2 & J3 are still arranged the same, so those instructions, are still valid. Both older and newer values (in red) can be used. 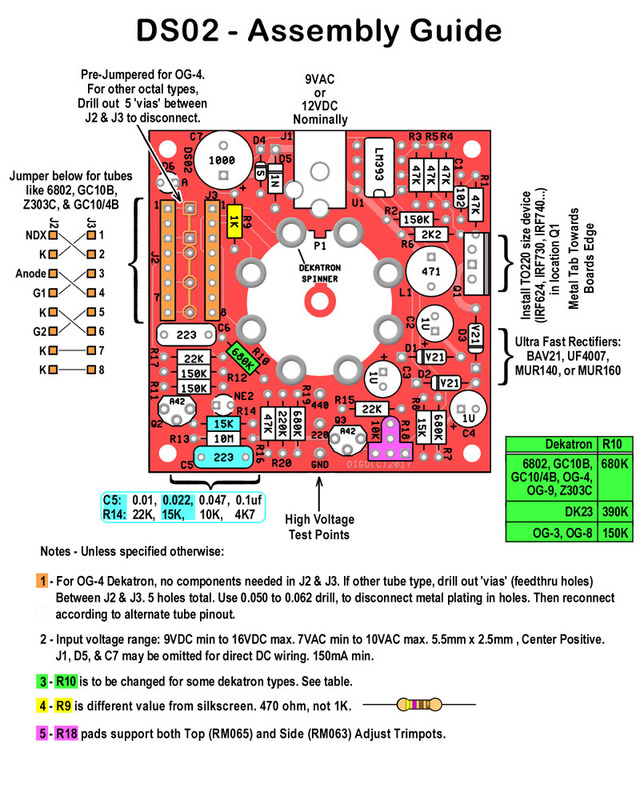 Newer values shipped with kits solder after June 9, 2015. 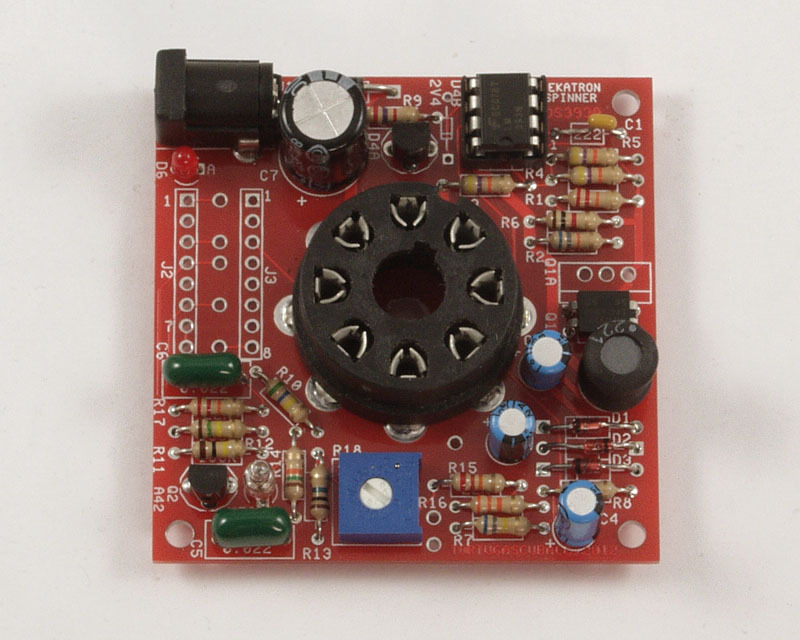 This circuit can be divided into two sections: (1) the switch-mode Hi-V power supply, and (2) the relax-osc spinner. In the “nixie realm” switching supplies have been based on one of the three following chips: the MAX1771, the MC34063, or the NE555. If you look at the board, you’ll see that the chip is way too far from the power FET, so it can’t be the MAX1771, since it would not be stabile, with this less-than-ideal layout. Its not using a MC34063 either. Maybe, a cheap 555. 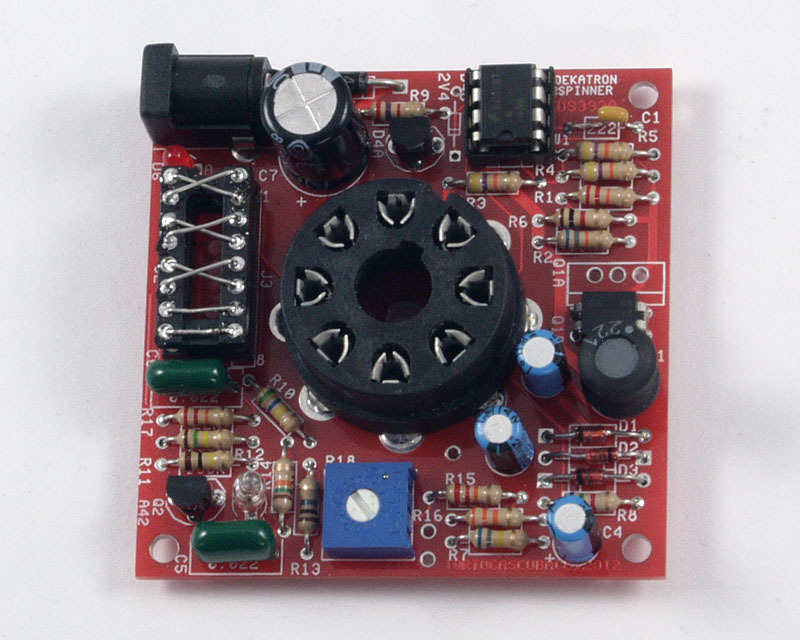 Nope, even cheaper, a LM393 dual comparator. This chip sells for less than the 555, but don’t let that fool you. In this app, its actually superior to the 555. 555’s usually use a trimpot to adjust the voltage. They don’t possess an internal voltage reference like the MAX1771 and MC34063. If you use an external reference (zener diode) with the 555, you need a voltage comparator, too. Most hobbyist use a common op-amp for this purpose. It does work, but not only is it not ideal and it adds an additional chip. 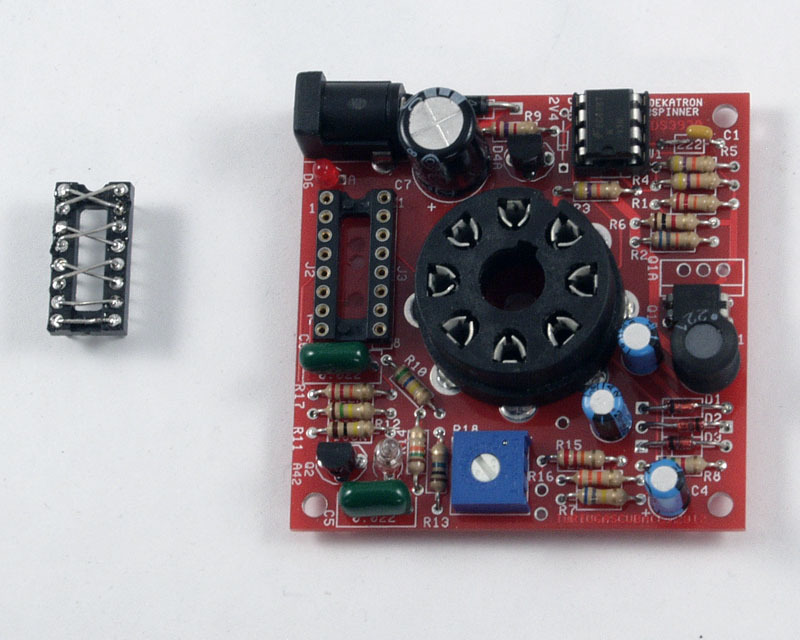 Here the chip IS a voltage comparator, so one stage is used to compare the reference (D4) to the output, while the other stage is used to make a squarewave generator. That squarewave pulses the switch FET, which in turn generates high-voltage pulses, by switching current thru the inductor (L1). Also, the turn-OFF of the FET is the more important transition, than the turn-ON. The LM393 has open collector outputs. Turn ON is slow, thru R6, but turn-OFF is quick, thru its open collector stage, to GND. This is opposite than the MC34063, which has active pull-up (ON), but passive pull-down (OFF). With the MC34063, an active pull-down stage must be added (MK1.5). This supply has plenty of power to drive that one dekatron, and several more. To make the required 450V, the supply switches 225V, and uses a doubler, to make the 450V. 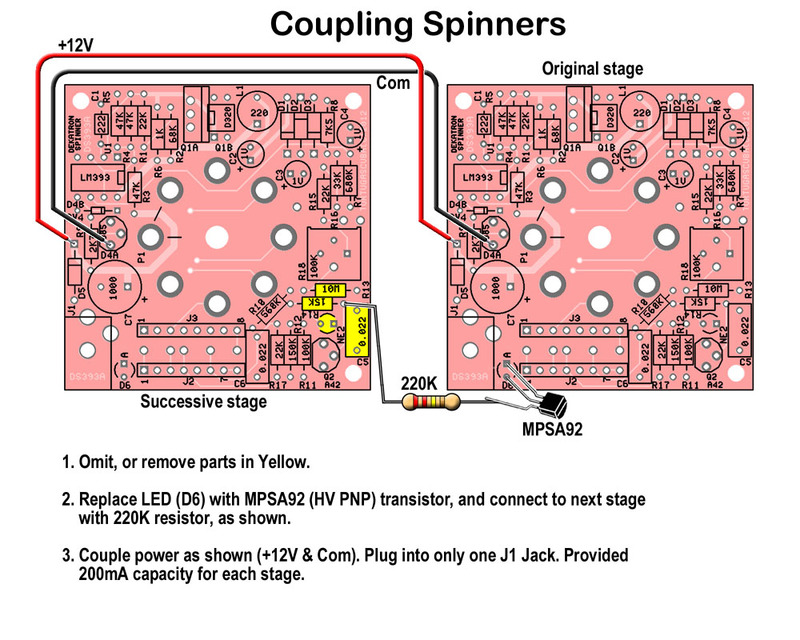 The 225V can be tapped to drive small nixie clocks, if less than 15mA is all that’s required. The relax oscillator section, makes up only a small portion of the circuitry. It uses a simple neon relaxation oscillator (R13, C5, NE2) to make the cadence pulses. These pulses pass thru the base-emitter leg of Q2, thru R14. R14 moderates the current going thru Q2. In doing so, the time needed to discharge C5 increases. Q2 pulses the dekatron’s guides. G1 directly, and G2, delay thru R17 & C6. R14 may need adjusting, in order for the pulses to be wide enough to step the dekatron. If made too large, R14 will take too long to discharge, and the oscillator will stall. The dekatron’s cathodes (K, NDX) are biased to roughly +60V. That way, the pulses at G1 & G2, which transition from ~+120V to 0V, look like +60V to -60V, as the dekatron sees them. A negative voltage on the guides (G1 & G2) is needed (relative to the cathodes), for proper stepping. For the most part, component selection is not too critical. They largely need to just fit on the board, in their assigned locations. All of the resistors are common 1/4W 5% carbon film resistors. These resistors also have high enough voltage ratings needed in this circuit. The most critical parts are the Coil (L1), power FET (Q1), and ultra fast recovery rectifiers (D1-D3). Don’t skimp on these parts. The coil should be rated for peak currents of at least 0.5amp. The FET should be rated for at least 250V, and an ON resistance, no more than 3 ohms. Use rectifiers with switching speeds of at least 100nS. 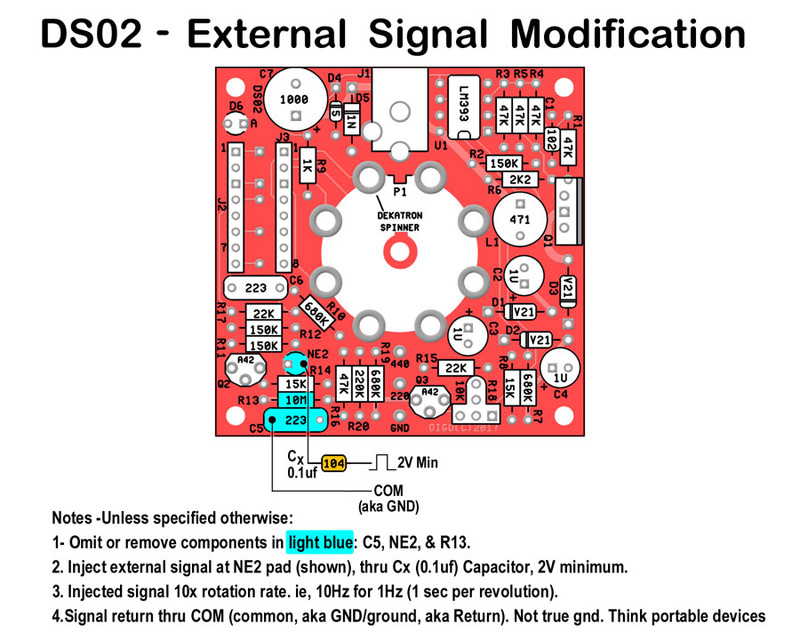 Your common 1N4004, has switching speed is many times slower than that, and is not usually given in datasheets. It has also been shown that many Chinese (Hong Kong included) vendors just re-stamp parts, so buy from large stocking distributor, whenever possible. Note: If you bought this as a kit (with the parts), you will receive either D4A or D4B, and either Q1A or Q1B. You only want to install one type of part in these locations. If you install D4A, DO NOT install D4B, or the other way around. If you install Q1A, DO NOT install Q1B, or the other way around. The ‘A’ and ‘B’ locations are provided as a convenience, allow different component ‘packages’ to be used. Not every component location needs to be occupied. As of late December 2012, D4B (BZX55B2V4) zener diodes are being shipped, replacing D4A (LM385), in the kits. These are glass diodes (DO-35 package), and look the same as D1 thru D3 (BAV21 rectifiers). Note the BAV21’s have “21” printed on them, and come in a set of 3 ! Please do not mix them up ! UF4007 can also come with kits for D1 thru D3. They use a DO-41 package, which is the same as the 1N400X (D5). Again do NOT mix them up ! The LED (D6) is just not an indicator. Remember to install it, in its proper orientation. It provides a current path from the dekatron’s Index cathode. If not installed, the dekatron will stall, and stop spinning ! 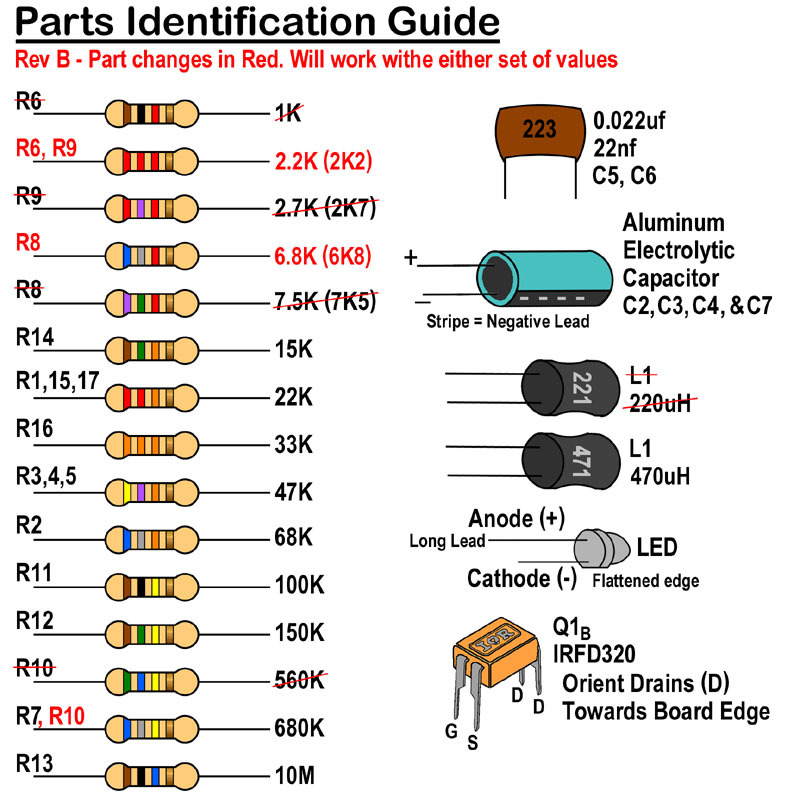 Contact me, if you are missing components that DO NOT have the ‘A’ or ‘B’ suffix. If you find a transistor that’s not in the BOM, please check it against the acceptable substitution guide, by clicking here. If you just wire up your kit, the octal socket (P1) will be pre-wired to accommodate the Russian OG-4 dekatron. 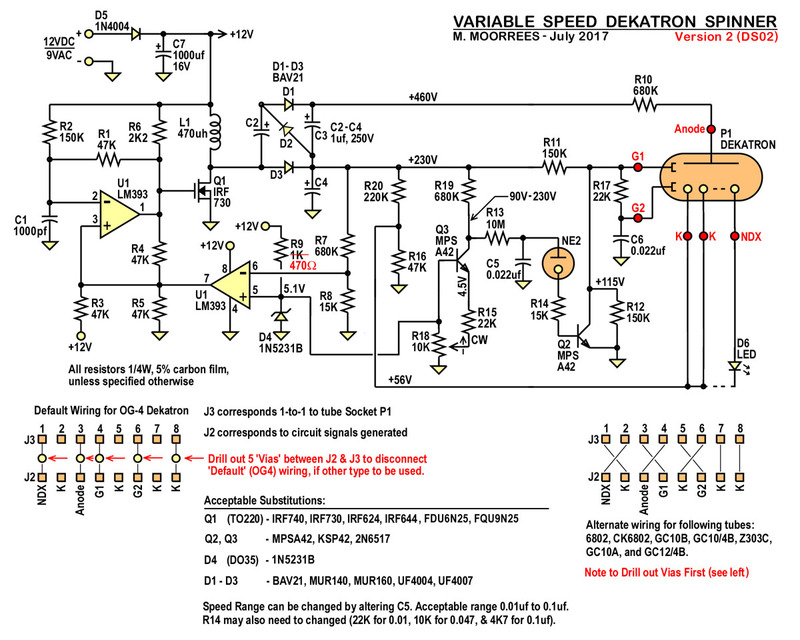 This is the most commonly available octal base dekatron at this particular time (end of 2011). It can be rewired for other types of octal base dekatrons. The 6802 and GC10B (& GC10/4B) are the most common Western types, and the re-wiring for those is shown, in several places. Several headers can be made, so the one kit can accommodate several tube types, simply by changing the header. Also, note that several models use a smaller anode resistor (R10). To accommodate this, the R10 slot, can have the smallest resistor value inserted, which is 150K for the OG-3. The additional resistance can be made up, by adding a resistor on the headers. For a 6802, or GC10B, the total R is 560K. Less 150K, is 410K. A 390K is close enough, so solder it between pin 3 and pin 13 (pin 4 of J3) of the ‘6802’ header. For a DK23, 390K less 150K is 240K. A 220K will do, and goes between pin-3 and pin-9 (pin 8 of J3), of the DK23 header. Now find yourself a 9VAC, or 12VDC (200mA) wallcube transformer (aka adapter), with a 5.5mm OD x 2.5mm ID power plug, and of course that dekatron tube, and you’re good to go. Omit or remove C5, R13, and NE-2. Injected pulse will be 10x revolution rate. For 1 revolution per second inject 10Hz. Note: successive stages are tacked on to the left. So the right most stage is the fastest, and each successive stage, left, is 1/10th the speed of the prior stage. Enlarged schematic, BOM, assembly drawing, and alternate tube jumper drawing, at end of document. Enjoy your Kit, and thanx again.